Christmas season is such a special time and a lot of preparation is done to ensure that everything is in the right place for the celebration on this special day. One of the key areas that is given a lot of emphasis is in the home decoration for christmas celebration purposes. There should be a dynamic shift from how your decorated the house the previous year to the current year for a more fulfilling day. The creative christmas decorating ideas shared here will give you insight on how you can transform your home for an exciting, merrier environment. One of the biggest joys of the Christmas season is the outpouring of love from family and friends. Instead of shoving Christmas cards and photos into a stack, surround yourself with holiday wishes from your loved ones with this creative idea. The fun and innovative way to use an array of Christmas cards as home decor is to simply frame them! Attach a couple of rows of wiring to the back of a large frame; use mini clothespins to hang cards from the wiring. While this turquoise frame used by Erin of the parenting and crafting blog Sunny Side Up is undeniably cheery, you could also use one that’s red or green for a look that’s more distinctively holiday-themed. Over the years, most people collect more ornaments than a single tree could possibly hold. Instead of packing them away indefinitely, try this approach! 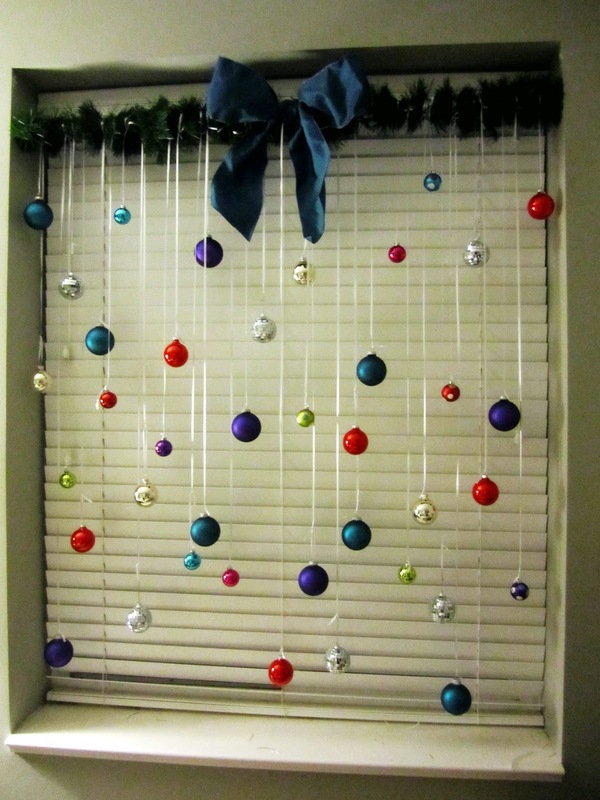 Line the top of your window with a garland and bow; then tie your favorite Christmas ornaments to it with ribbons of varying lengths. While we love the uniform design that Nichelle of Vintage Wanna Be created with multicolored glass balls, you could also take a more personalized approach by hanging a variety of ornaments from your own collection. This lovely piece of Christmas wall art is made almost entirely of scrapbooking supplies that crafters may already have on hand. Fill a deep shadow box about half way with small jingle bells (or ornaments) of your choice, and use double-back tape to affix a holiday-themed piece of scrapbooking paper to the backboard of the box. You’re left with a chic Christmas decoration that looks as though it took much more effort and talent than it truly did to assemble! Guests who visit your home for a holiday party will want to look their best. This piece provides them with an opportunity to discreetly check their appearances, while also acting as a gorgeous piece of décor for your wall or mantle. 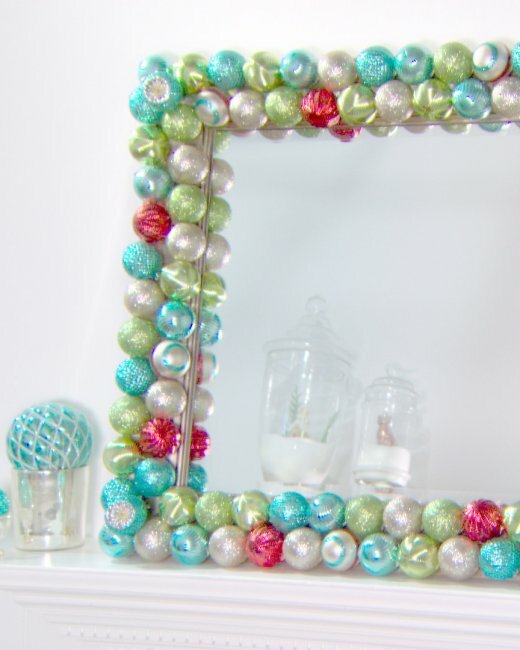 Just use a permanent glue to affix ornaments in an arrangement around the edges of a large mirror. The specifics of the arrangement will be left up to your own creativity, but make sure to remove the tops of the ornaments before getting to work, or your end product will have an awkward appearance. While traditional Christmas wreaths are undoubtedly beautiful, we have to admit that we’re a bit sick of seeing the same red and green designs on every door we pass during each holiday season. This fun alternative is easy to make with just a few items that are probably already hiding around your house! The first step is to paint a wood frame in a festive color of your choice. After the paint has dried, use a staple gun to fasten ribbon-hung ornaments of varying lengths to the back of the frame. If you’re feeling especially crafty, use a hot glue gun to affix an oversized ribbon to the front of the frame before hanging on your door. This decorating idea is not for those who are faint of heart when it comes to DIY projects, but even though it requires some elbow grease and patience, the end result is entirely worth it! 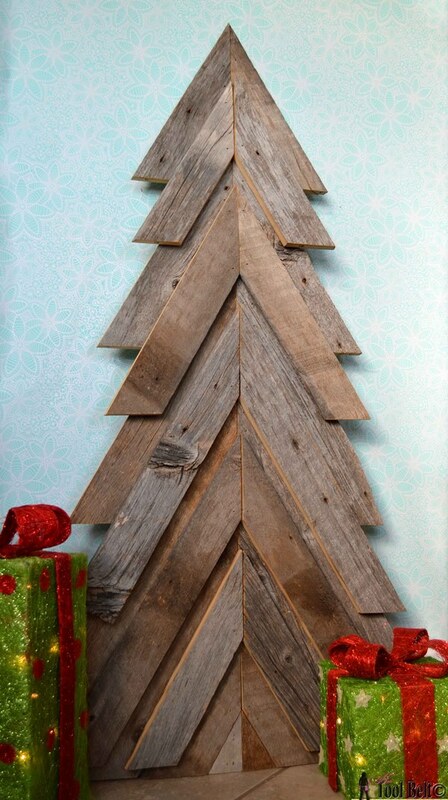 Whether you want this tree made of weathered barn wood to replace a traditional pine counterpart, or you are just looking for an extra piece of décor for your home this season, check out the blog Her Tool Belt for step-by-step instructions on how to make it.